In 1942 Frederick Kiesler was the unconventional architect of the curvilinear interiors of Peggy Guggenheim’s legendary The Art of This Century gallery. But long before that, in 1927 he had been tasked with the window displays for Saks Fifth Avenue in New York. The book he wrote about that experience, Contemporary Art Applied To The Store And Its Display, developed his theories about the aesthetic laws for ideal window displays, based on his analysis of paintings and applied art. He considered applied arts the bridge between art and daily life. Department stores with their plate glass windows created an entirely new entity, a shallow pictorial space in the public realm. Kate MacGarry has taken Kiesler’s words as the departure point for bringing together the work of six artists, not all of whom she represents, to make this delicately poised yet probing exhibition. Walking in to the space you come first to work by Céline Condorelli: a pale wall painting of green and egg-yellow geometric forms that break up the white wall and a semi-transparent, free standing screen in some kind of fine, metal meshes that picks up the colours and elegant geometric forms of the wall painting. Together the works frame the space and gently choreograph the way the visitor negotiates the gallery. Turning to your right you come across a new drawing by Donna Huddleston. An artist who has worked in theatre and film, her drawings, whether monumental, or more intimate in scale as here, create all-female narrative spaces. 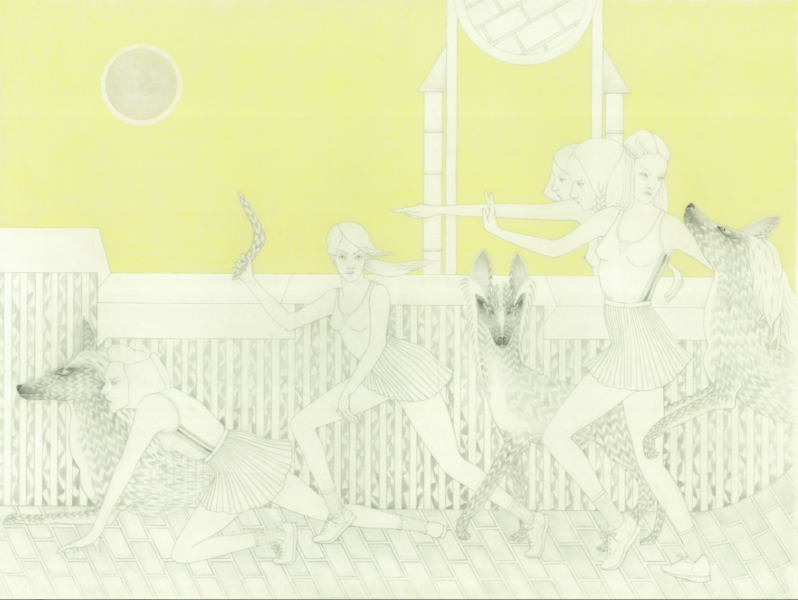 Here, a group of young women move through an urban landscape, accompanied by wolves. For this half Australian artist, the boomerang in the hand of the leading figure marks the group as hunters. A strong interest in ancient Egyptian painting translates into the characteristic planar composition, as well as the bodily gestures of some of the figures. Goshka Macuga’s contribution to the show was part of her extraordinary exhibition earlier this year at the Prada Foundation in Milan. Across a number of works she used the form of molecular models to map connections between influential thinkers. Here she connects Olympe de Gouges with the Guerrilla Girls. Olympe de Gouges was a playwright and political activist in 18th century Paris – most famous for her Declaration of the Rights of Woman and the Female Citizen (1791) – and executed during the Reign of Terror for her opposition to the Revolutionary government. Connecting her to the instantly identifiable mask of the Guerrilla Girls, Macuga activates centuries of discourse on the position and role of women in society. The wall-based works of Laura Gannon, Patricia Treib and Corin Sworn all variously deal in forms of shallow space. 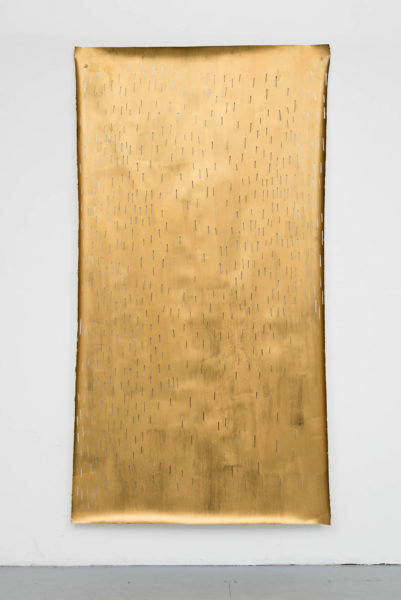 Laura Gannon’s work is pinned loosely to the wall so that the pierced surface of the gold panel creates shadows, making one acutely aware both of shimmering surface and the air bracketed between. Corin Sworn’s elegant blue panels were made using the resist fabric dying technique, with found objects placed under the fabric to create forms. Treib’s paintings seem to suggest frames and doorways, within which the biomorphic forms of her abstract compositions are suspended. In the 21st century the rectangular frame with which we are most familiar is the glowing digital screen, rather than the shop window. To pinpoint this fundamentally visual relationship to the mercantile world is a smart trope with which to connect these artists, and evidence yet again that the first and best way to experience artworks is in the first person. RIP Leonard Cohen (1934 – 2016). Tenancy ended.